A trained classifier in perClass provides decisions by default. However, the default setting may not be ideal for our application. In this chapter, we will learn how to use a powerful tool helping us to find desirable operating points in our applications: The ROC analysis. ROC abbreviation stands for the Receiver Operating Characteristic. 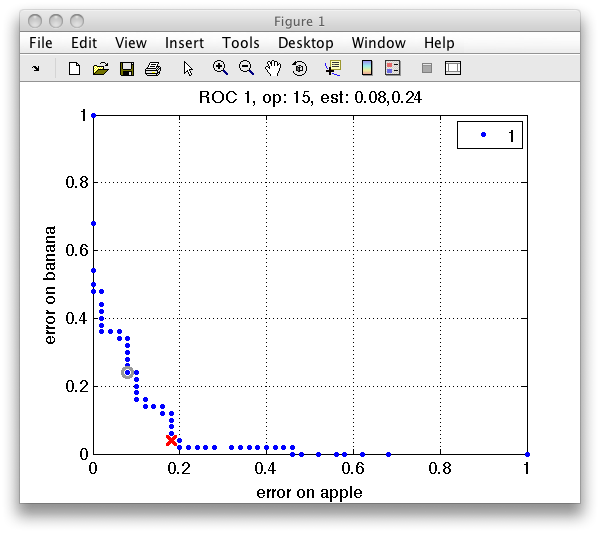 The basic idea of ROC analysis is very simple: For a given trained classifier and a labeled test set, define a set of possible operating points and estimate different type of errors at these points. Let us consider a two-class problem with apple and banana classes. We will select the two classes of interest (data set a contains also the third class with outliers called stone). 2 Gaussian model          1x2  single cov.mat. sdroc defined a set of operating points, estimated three error measures (error on each class and the mean error), and fixed the "current" operating point to minimize the mean error. 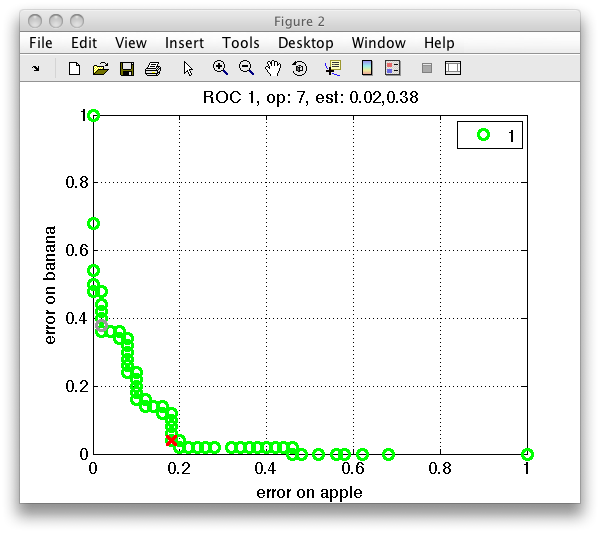 The ROC plot shows the first two measures in r, namely the error on apple class on the horizontal axis and the error on banana on the vertical axis. In the ROC plot, each blue marker represents one operating point. The current operating point is denoted by the red marker. When moving over the plot, the gray cursor marker follows the closest operating point. The figure title then shows the number of the cursor operating point and the values of the errors. Note that selecting an operating point is a matter of trade-off. When we try to minimize error on one class, the error on the other at some moment inevitably increases. Only in the situation without class overlap, we could select an optimal solution. In real-world pattern recognition projects, we do need to accept certain level of errors. ROC analysis allows us to carefully choose the acceptable trade-off. Each ROC object has one operating point set as "current". The current operating point may be fixed interactively in the sddrawroc figure by clicking the left mouse button. By pressing the s key (save), we may store the current operating point index back to the sdroc object in the Matlab workspace. A dialog will open where we can specify the name sdroc variable or pipeline with ROC. TIP: In the input dialog, you can press TAB key to move to the OK key and press ENTER. Alternatively, we may set the current operating point manually using the setcurop function on Matlab prompt. The easiest option is to directly provide operating point index (which you may see in the interactive plot). More details in the section on application-specific setting of operating points. You can see that the error on apple class was 0.6% (rounded to 1% in the sdroc display above) and the error on the banana class 4.2%. 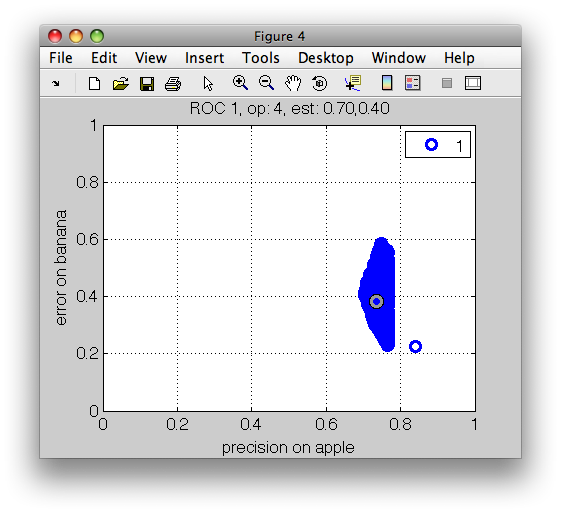 We can now change the operating points in the ROC figure and directly observe the changes to the classifier decisions. 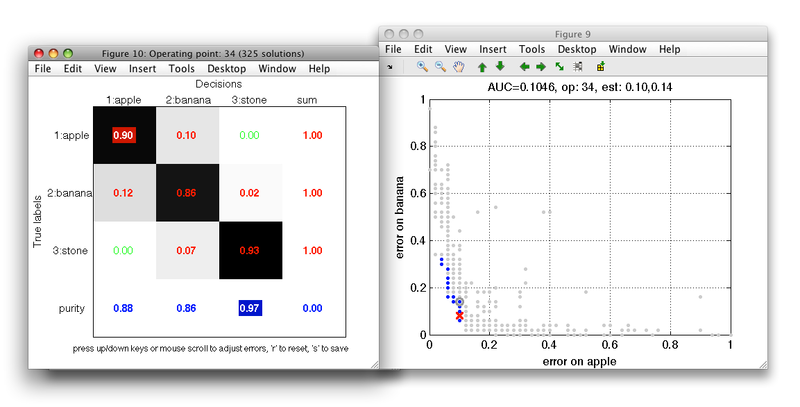 sddrawroc is able to interactively visualize confusion matrices at different operating points. The advantage of this approach is that it is applicable to arbitrary problems, while the visualization of decisions is valid only for 2D feature spaces. To open the confusion matrix window, press c in the ROC figure. The confusion matrix is opened in a separate figure. To view normalized confusion matrix, use 'n' key. We may define performance constraints directly in the confusion matrix by clicking on its entries. We may constrain errors, performances and also the per-decision precision in the last row. When an entry is clicked, the ROC figure gets updated and rejected operating points are disabled. 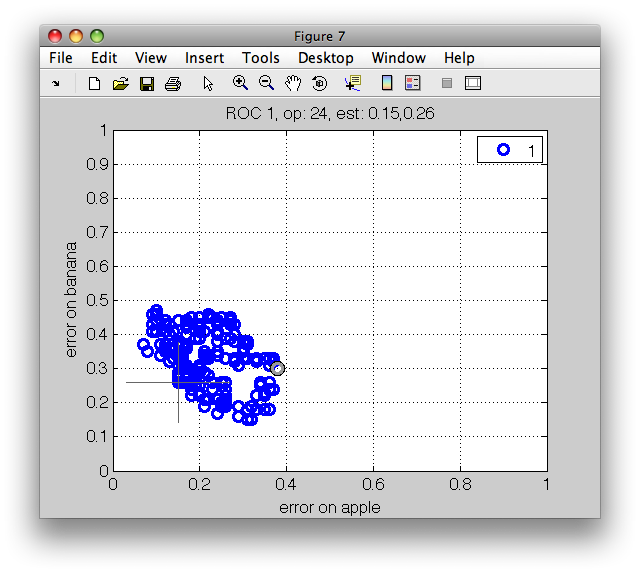 When moving mouse over the ROC plot, only the admissible entries are considered. This allows us to quickly inspect solution subsets given multiple constraints. The constrain value is remembered and applied even if the confusion matrix content is updated. This may happen when user moves the mouse over the connected ROC plot or by interactively lowering errors in the confusion matrix (see next section). The actual value in the error field cannot get above the original constrained error. Clicking a constrained field again disables the constrain. Interactive confusion matrix allows us to directly minimize errors or maximize performances. We may do so by pointing mouse to a specific field with non-zero value and using a mouse scroll-wheel or up/down cursor keys. Confusion matrix will show a new cost-optimized solution. Note, that selected operating point in the ROC figure (red cross marker) will move acordingly. Combination of constrains and interactive cost optimization in confusion matrix allows us to quickly explore possible solutions in a multi-class problem and find best trade-off. The access to performance estimates is useful for custom selection of an operating point using application constraints. Note that in the measures option, we specify the measure name (FPr) followed by the class name. This is needed because the false positive rate depends on the definition of the target class. Because we specify the target is apple, the FPr is the error on banana misclassified as apple. All measures are also available for multi-class ROC. Non-targets are then defined as sum of all remaining classes. 1 Mixture of Gaussians    2x8  26 components, full cov.mat. 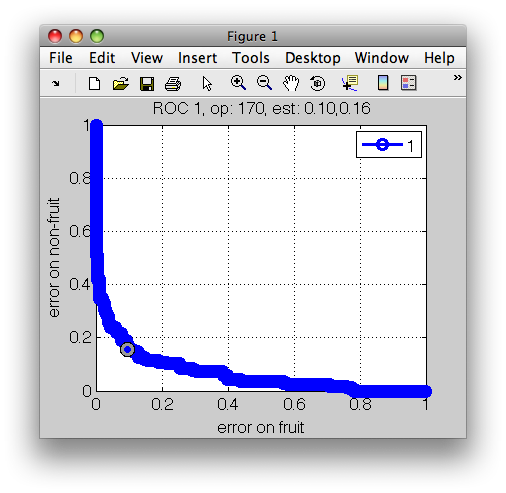 Note that you can switch between class errors shown the the ROC plot using the cursor keys (left/right for horizontal and up/down for vertical axis). In this section, we illustrate how to build ROC in target detection setting. This is achieved by thresholding the output of a model trained on a single (target) class. Let us, for example, consider the problem where we want to detect all fruit in our fruit data set which contains apple and banana fruit examples and some stone (outlier) examples. We will first create a two-class data set labeling all non-stone classes as fruit. 1 Mixture of Gaussians    2x1  10 components, full cov.mat. By thresholding the fruit model output, we effectively reject outliers. Common technique is to apply one or more performance constraints and then select an operating point by specific criteria. This may involve maximization of certain performance measure or minimizing total loss. The last approach is referred to as cost-sensitive optimization. 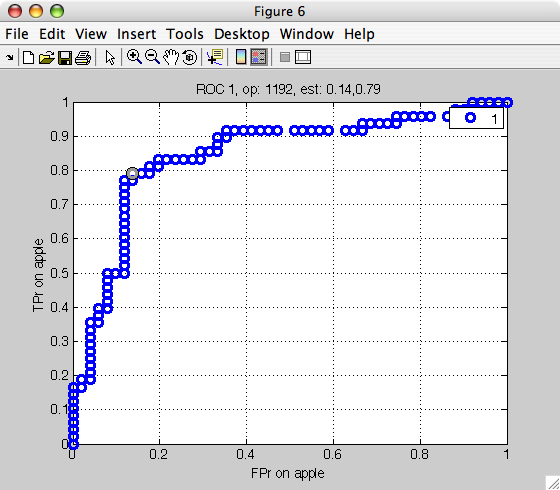 We can observe, that if we find 99% of apples, our classifier returns 30% of false positives (bananas misclassified as apples). Typically, we know specific constraints for our problem. For example, the maximum error on fruit may not exceed 10%. We may apply performance constraints using the constrain method. It takes existing ROC object, specification of a performance measure (by its index or by name) and the constrain value. Note that we ma reach 5% better error on non-fruit at the expense of higher mean error. Second type of selecting operating point is based on an idea of misclassification costs. We can penalize different types of errors in confusion matrix and minimize classifier loss. To perform cost-sensitive optimization, we need to fix our cost specification. This may come in a form of a cost matrix corresponding to the confusion matrix. 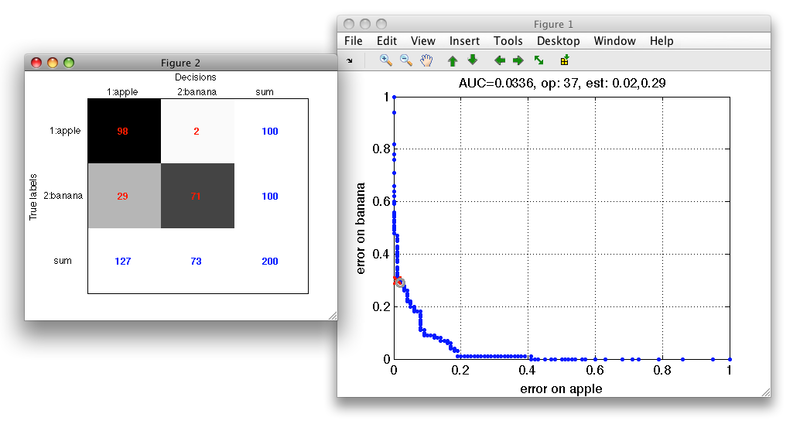 The confusion matrix for the operating point found shows that we minimized the apple / banana error. Of course we pay in terms of banana / apple as each solution is a specific trade-off. ROC characteristic is a set of performance estimates computed at a set of operating points. Therefore, when cross-validating a model on a data set, we end up with multiple ROCs, one per each fold. It would be useful to accompany ROC estimated in cross-validation by mean and standard deviation for each operating point similarly to the standard point estimates such as mean classification error. Estimating ROC with variances is not trivial as the characteristics computed on different test sets comprise different operating points (thresholds or weight vectors). Variance estimation for two-class and multi-class ROC analysis using operating point averaging. P. Paclik, C. Lai, J. Novovicova, R.P.W.Duin. Proc. of the 19th Int. Conf. on Pattern Recognition (ICPR2008, Tampa, USA, December 2008), IEEE Press, 2008. The main idea is to estimate unbiased soft outputs of the model of interest using stacked generalization (cross-validation storing model soft outputs). ROC analysis on these soft outputs defines a single set of operating points. Going back to individual folds of the stacked generalization, we may estimate per-fold measures of interest at identical operating points. Eventually, we obtain their means and standard deviations over folds. The sdcrossval command returns string result summary, ROC object with per-fold estimated measures and evaluation object containing the per-fold trained classifiers. sddrawroc shows the error-bars around the operating points. By pressing the 'f' key, sddrawroc displays the per-fold performances. This helps us to understand the worst-case misclassification scenario.